Bronte Beach is one of Sydney's best-kept outdoor spaces and its best-kept secrets. It is a true local hangout, year round. Bronte baths lie at the southern end of the beach, with a 30 metre lap pool suitable for the serious swimmer as well as a shallow enclosure perfect for kids. The surrounding Bronte Park is spacious enough to host the ever popular family barbies, excitable dogs as well as that essential game of cricket. The park is also lined by Bronte Road's string of charming cafes to its south. This image belongs to the travel and nature stock photo library. This stock photo of Bronte Beach at Sunrise is available for licensing for commercial and editorial uses including websites, blogs, books, magazines, brochures and advertising. Restrictions may apply for images which contain third party copyrighted material or sensitive subjects. Photos of artwork are for editorial use only. 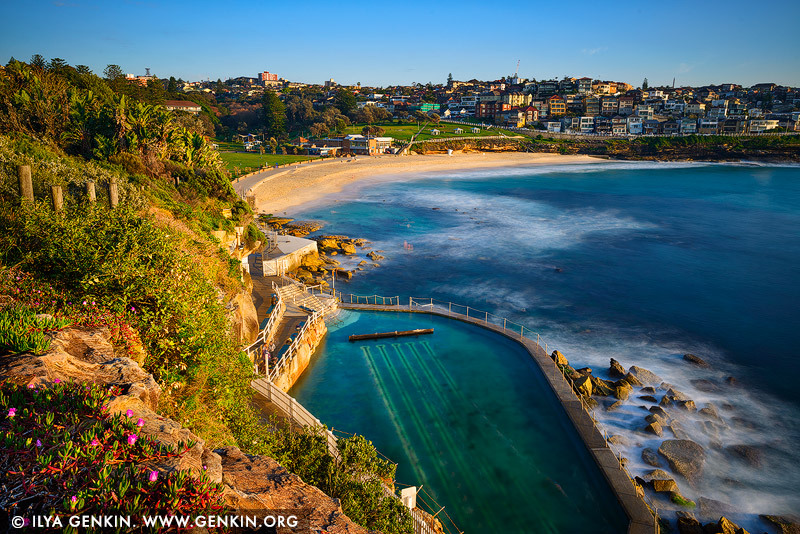 This image id AU-BRONTE-BEACH-0002 of Bronte Beach at Sunrise, is copyrighted © by Ilya Genkin. This is not a public domain image.